Introducing the new kale chip – crispy baked collard greens. If you follow me on Instagram, you will more likely than not see these chips on my dinner plate at least once a week. Though kale chips are great, my stomach does NOT like them. Therefore, I decided to come up with a great alternative that produced the same, crunchy and nutritious snack or side dish – collard chips. Of course, I am assuming that I am not the first to create them, but I thought I’d share the recipe anyways. In the summer I like to brush oil on whole collard leaves and grill them until charred around the outsides (I call them “collards on the cob”). However, since the cold, January nights have officially set in, baking the green indoors is a much better option. If you have ever had, and liked, a kale chip, you will love this version. Of course, for those of you who have an aversion to kale chips, these collard chips are a great place to start, as they are pretty non-offending to most all palates. Not only that, but I find the term “collard greens” to be much less “offensive” to those that believe that they hate greens. Due to there being no super-food-hype over collards, no one tends to have an already pre-conceived notion that they are healthy and thus unappetizing. Instead, my collard green chips are intriguing to everyone, and almost always get stolen by friends and family members. I like to serve them as both an appetizer when waiting for dinner, or as my “side dish,” that just so happens to take up more room then other items on my plate. 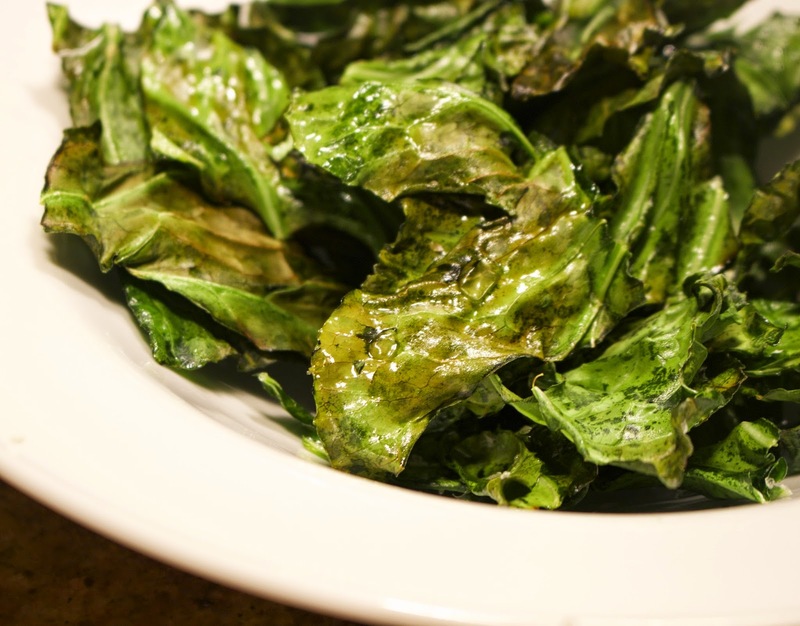 Really, I can never get enough of this crispy, crunchy collard chips, and I know that you will be the same way! Wash and dry collard greens, cutting off the stem into long strips. Cut strips of leaves into like-size squares, placing in a mixing bowl. Start with 1 tbsp of avocado oil, drizzling over leaves and mixing together with hands until every “chip” is coated. 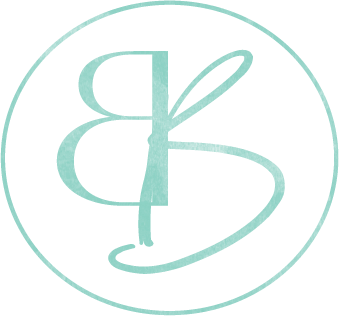 *If 1 tbsp is not enough, add an extra tbsp, one tsp at a time. 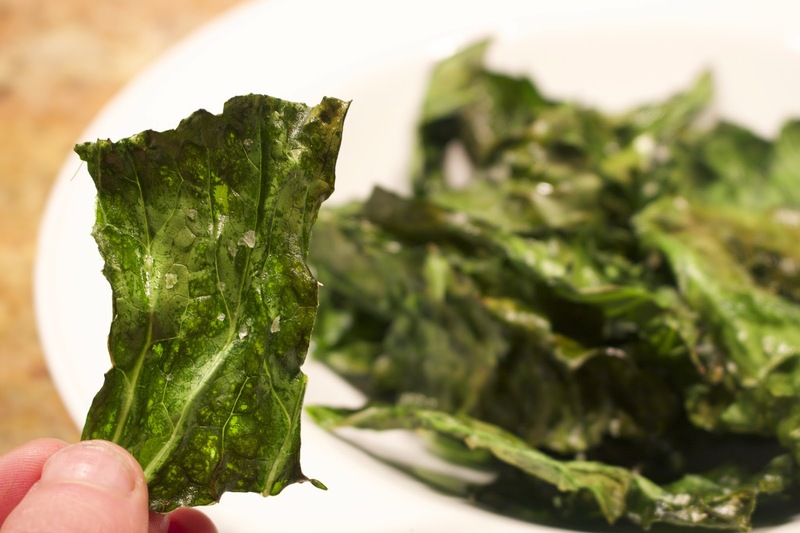 Place collard chips in a single layer onto lined baking sheets, sprinkling each tray with 1 tsp of sea salt. Put baking sheets in the oven and allow chips to bake for 5-7 minutes, until brown around the edges. Remove from the oven and allow to cool for a few minutes before transferring chips to a serving bowl.